In the past if you wanted to deploy a new office for 10 people it meant buying an MPLS connection, Avaya Gateway, Avaya LSP and possibly getting a Private Rate Interface (PRI) for local calling. With Avaya SIP remote worker this no longer makes sense. The SIP Remote Worker feature of Avaya Aura not only saves you money by not needing to purchase extra hardware and legacy telephony circuits - it greatly reduces deployment time. With an Avaya Session Border Controller for Enterprise (SBCE) you have the ability to easily and securely deploy remote users anywhere and load balance across data centers. The SBCE is a SIP security device that can be placed behind your firewall to handle the registrations and feature delivery to your remote phone users. Now you can take your favorite Avaya 96X1 phones and deploy them out to your users wherever they may be. This allows for a consistent user experience for remote workers and also is an option for small office locations where spending on IT infrastructure may not be in the budget. 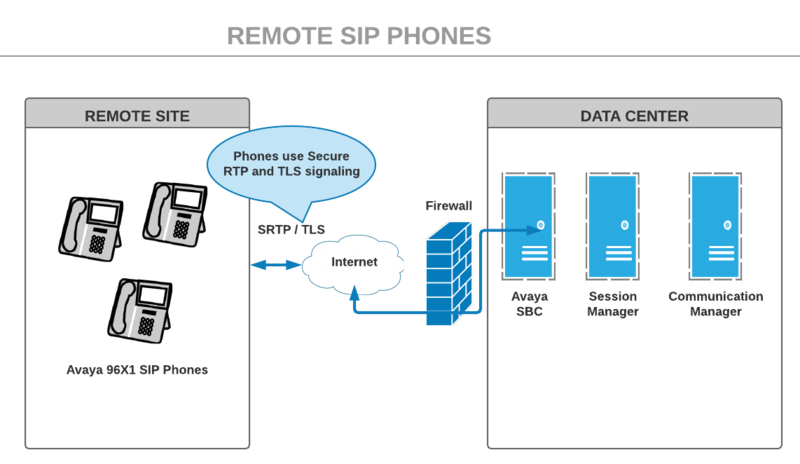 The remote phones register using the SIP protocol encrypted with TLS and send audio using secure RTP without any need for complicated VPN settings and tunnels. This allows you to concentrate the remote connections into your network, which is always a good security practice. The remote worker phones are extensions off of your Avaya Communication Manager system with extension numbers that fall within your dial plan - giving you full control over the resources. The Avaya SBCE works in concert with Session Manager and Communication Manager to ensure users have a consistent and quality experience, whether they are at a remote satellite office or at headquarters.